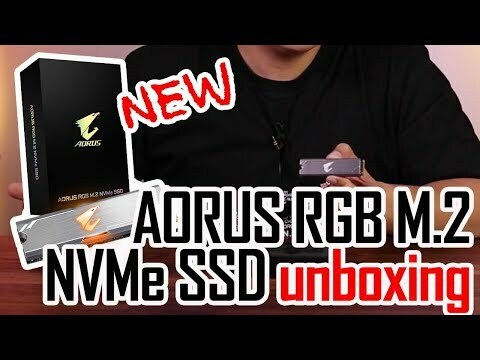 game on and enjoy an unbelievable performance The new AORUS RGB M.2 NVMe SSD with Heatsink, is the industry's first RGB M.2 SDD which can synchronize with compatible RGB motherboards. Featuring speed of up to 3100MB/sec sequential read, and up to 1050MB/s sequential write. This compact form factor of 2280 also has a height of just 8.1mm. Discover next level computing with impressive storage capabilities and experience an SSD that features RGB lighting with RGB Fusion 2.0. Choose from five incredible interactive lighting effects, you can access these from RGB Fusion Utility. designed for gamers with impressive speed Get ready to enter the next generation of computing, with slicker in-game streaming and graphic intensive rendering with the new NVMe interface controller. 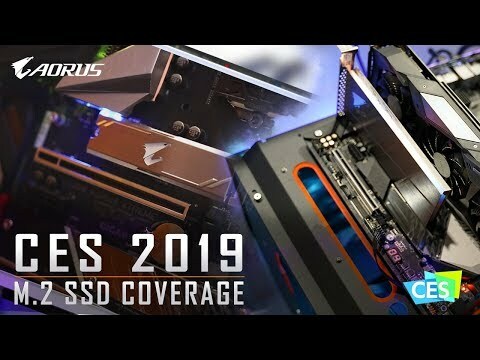 The AORUS RGB M.2 SSD provides tremendous speed up to 3100MB/sec sequential read, and up to 1050MB/s sequential write. Additionally, the heatsink keeps the controller and memory temperatures expertly low, guaranteeing that the SSD performance won't be compromised. choose from numerous lighting effects The AORUS RGB M.2 SSD is the industry’s first RGB M.2 SSD, that can synchronize impeccably with motherboards. It supports five immersive lighting effects including static, flash, double flash, and colour cycle. Enjoy a colourful RGB SSD that bursts into life with stunning lighting via the RGB Fusion 2.0 Software. * Compatible motherboards are the Z390 AORUS series and X299 AORUS MASTER. personalize your setup with lighting profiles Along with an incorporated intuitive user interface, RGB Fusion offers a better solution for modifying the lighting effects across all supported devices. You can personalize your gaming setup with your own flair and show off your build by sharing the lighting profiles. Let your motherboards, graphics cards or peripheral products shine! With the new gaming mode, lighting effects are interactive with selected games to bring you the most immersive gaming experience. monitor the ssd's status with ease The freshly restructured SSD Tool Box is an innovative application that assists users by monitoring SSD Status, providing general information such as model name, FW version, health condition, drive optimization and it also identifies sensor temperature. Furthermore, users can clear all the data with the Secure Erase function. You can download the SSD Tool Box from the Support. super small 2280 form factor M.2 slots are becoming more prevalent on motherboards recently, as users can easily install the SSD to enjoy a much faster response. The small form factor which is M.2 2280 is a flawless fit to all different kinds of PC upgrades. 5 year warranty for peace of mind Extreme performance comes from high standard testing and the AORUS RGB M.2 SSD comes with a limited 5-Year warranty, Phison Controller, high quality 3D NAND TLC Flash Memory from Toshiba.